Grain Sampling Probe, Brass 51" with 8 Slots and Open Handle. Also available in Spiral for Vertical & Angled Sampling. 7 lbs. 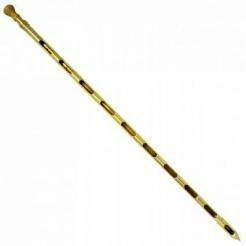 Grain Sampling Probe, Brass 63" with 10 Slots and Open Handle. Also available in Spiral for Vertical & Angled Sampling. Grain Sampling Probe, Brass 72" with 12 Slots and Open Handle. Also available in Spiral for Vertical & Angled Sampling. 9 lbs. 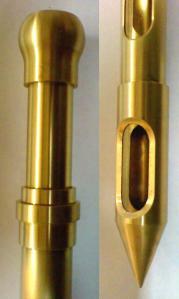 Grain Sampling Probe, Brass 96" with 16 Slots and Open Handle. 13 lbs. PARTITIONED Grain Sampling Probe, Brass 63" with 10 Partitioned Slots. Vertical & Angled Sampling. 8 lbs. Grain Sampling Probe, Aluminum 72" with 12 Slots and Open Handle. Aluminum is Half the Weight of Brass, Easier to Carry Up Ladders. (No Image Avail, Designed same as Brass 72") 4 lbs. PARTITIONED Grain Sampling Probe, Brass 72" with 12 Partitioned Slots. Vertical & Angled Sampling. 9 lbs. Spiraled Grain Sampling Probe, Brass 40" with 6 Slots and Open Handle. Vertical & Angled Sampling. 6 lbs. Spiraled Grain Sampling Probe, Brass 51" with 8 Slots and Open Handle. Vertical & Angled Sampling. 7 lbs. Spiraled Grain Sampling Probe, Brass 62" with 10 Slots and Open Handle. Vertical & Angled Sampling. 8 lbs. Spiraled Grain Sampling Probe, Brass 72" with 12 Slots and Open Handle. Vertical & Angled Sampling. 9 lbs.